Colorful Reykjavik, Iceland's capital city. 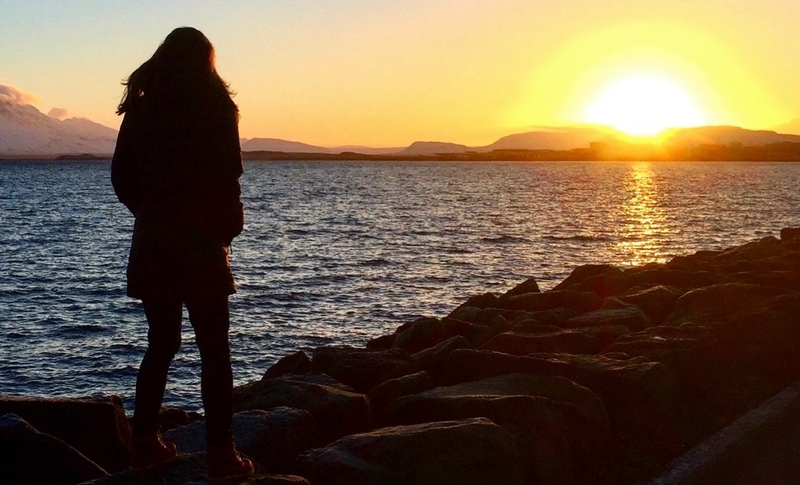 To stretch their worldviews beyond campus, a curious group of students traded in their classroom for the natural beauty of Iceland's moss-covered lava fields and the splendor of the Northern Lights. The wide-eyed University of Cincinnati honors students embarked on an International study-abroad journey earlier this year to explore the cultural impact of world folklore and traditions in a land where notorious elves, trolls and ghosts still reign supreme. Touching down in the land of fire and ice, Grace, along with his co-instructor Robin Selzer, assistant professor in UC’s division of Professional Practice and Experiential Learning, encouraged the students to observe the unique way this culture integrates the old traditions that form their identity with their global and personal relationships. 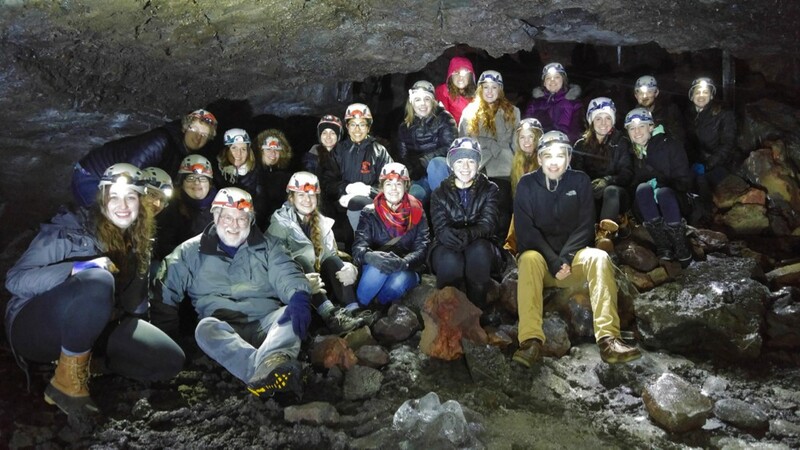 Kevin Grace (second from left) and his University of Cincinnati study-abroad honors students tour an underground lava cave in Iceland. 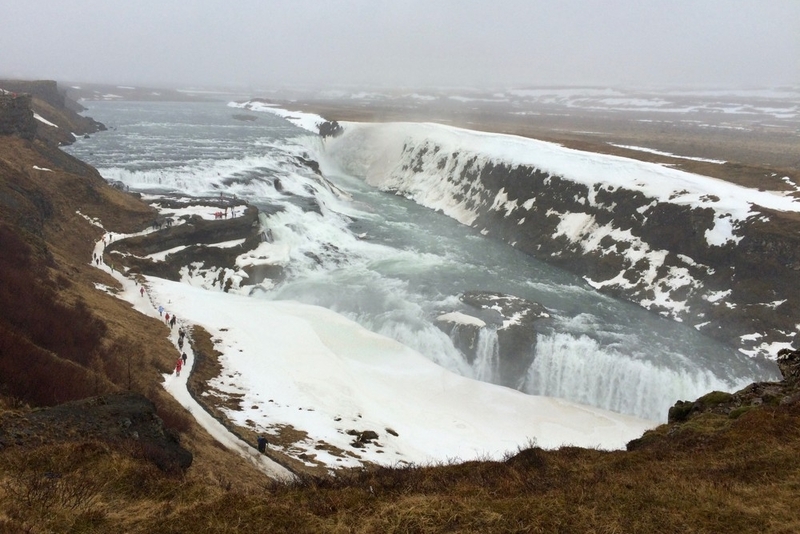 In gleaning an up-close and personal view for how this culture keeps the pulse of its folklore alive, the study tour mingled with other students from the University of Iceland. Soon after, Grace had them dining on local fare with Alda Sigmundsdottir, an internationally-known Icelandic folktale writer. The students listened as she detailed the country’s unusual naming custom where parents have to gain approval before they can give a first name to their newborn, and how the unique surnames originate from the father’s (or sometimes mother’s) first name. “While getting a feel for the land, we explored the beauty of the countryside,” Grace said. “We saw magnificent waterfalls that spilled out onto basalt beaches and toured an underground lava cave. Climbing out of that, we crossed over gnarled volcanic rock fields covered in wild moss hundreds of years old, so we were encouraged to step lightly on the moss to try not to disturb it. 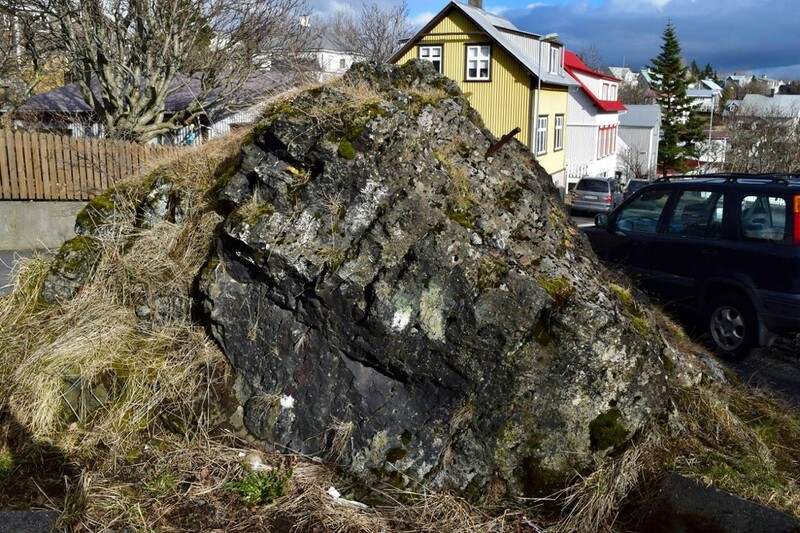 After attempts to move the rock for a construction project resulted in broken equipment, a compromise was reached after an apology was made to the rocks tenants (the hidden folk), which resulted in them staying and the road becoming a one-way street. Legend has it that elves, or the hidden people as they are often called, still reside among the rocks and countryside, Grace says, and if a person unknowingly steps on an elf or disturbs a rock or mound believed to be their home, that person will have many years of bad luck. Part of the Iceland story is that it has has one of the highest literacy rates in the world and a centuries-long love affair with books and reading that includes their legends and sagas. According to Grace, officials would rather focus on this aspect of global recognition than on trolls, but business people know what sells. Still, Grace says, the literary culture of iceland is evident everywhere and it fully complements the folk realm. “However, in the cases where the elves win, you will sometimes see a road built around a rock or boulder that is known to be inhabited by the little people so as not to disturb them,” says Grace. "Why take a chance?" 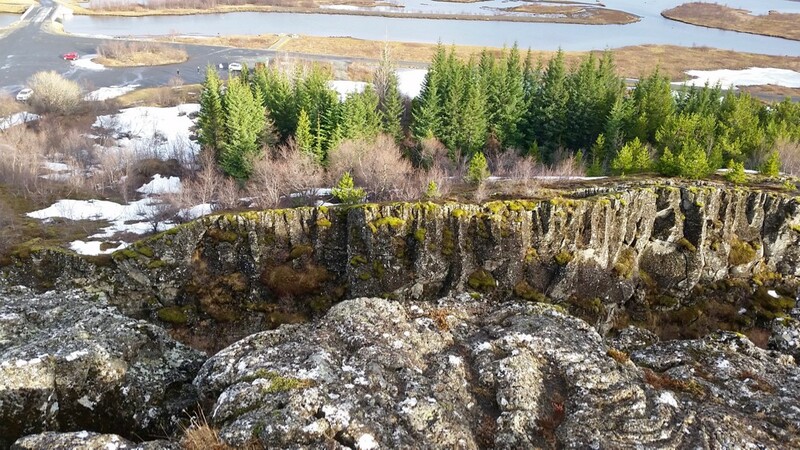 One of the many Icelandic lava fields covered with moss hundreds of years old. 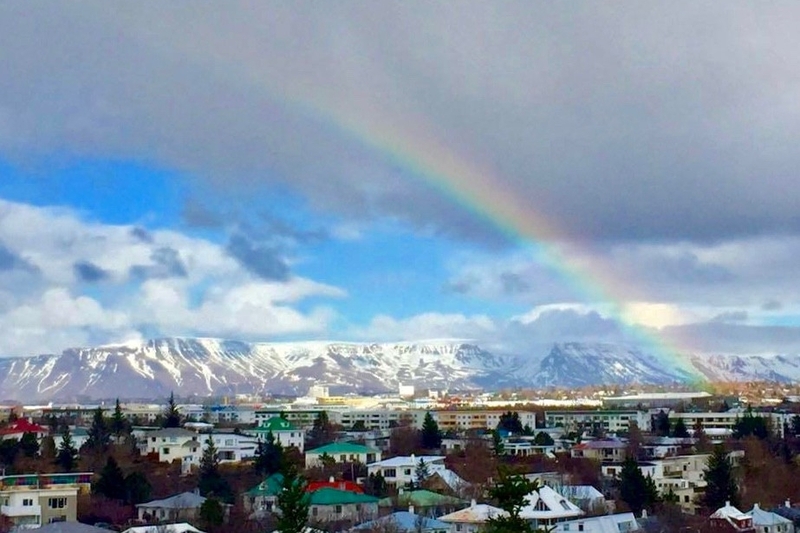 Several students describe the capital city Reykjavik (pronounced Ray-ka-vic), as a charming urban center bejeweled in a rainbow of brightly colored roofs. The side streets, they said, all seemed to lead to stunning views of the harbor from almost every vantage point. While enjoying the bounty of diverse landscapes, the group occassionally experienced an eclectic mix of weather. "The weather wasn't bad - mostly high 30s-low 40s," says Grace. "But within the same hour we sometimes had drizzle, snow, sideways rain, wind, sunshine, clouds, and blue skies - sort of like Cincinnati." 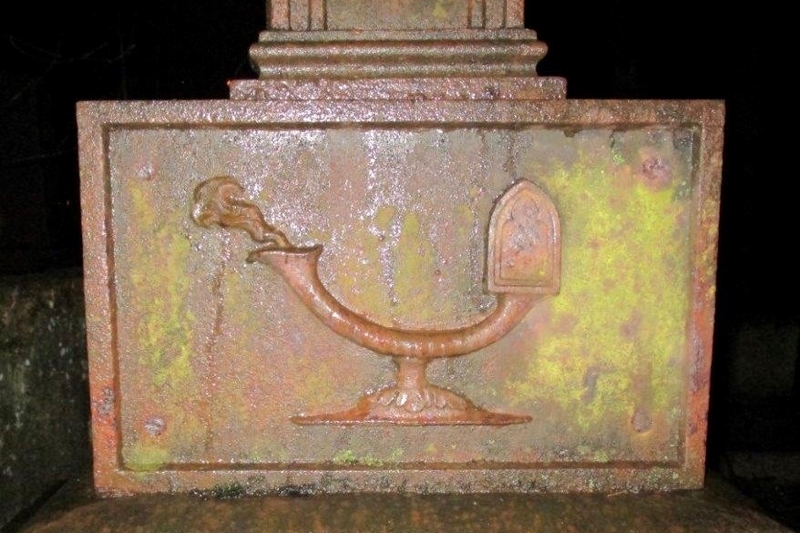 The highlight for many students while in the capital city included the old cemetery tour where the guide explained the significance of the bronze cross on one of the gravestones artfully etched with the symbol of an oil lamp (see above). 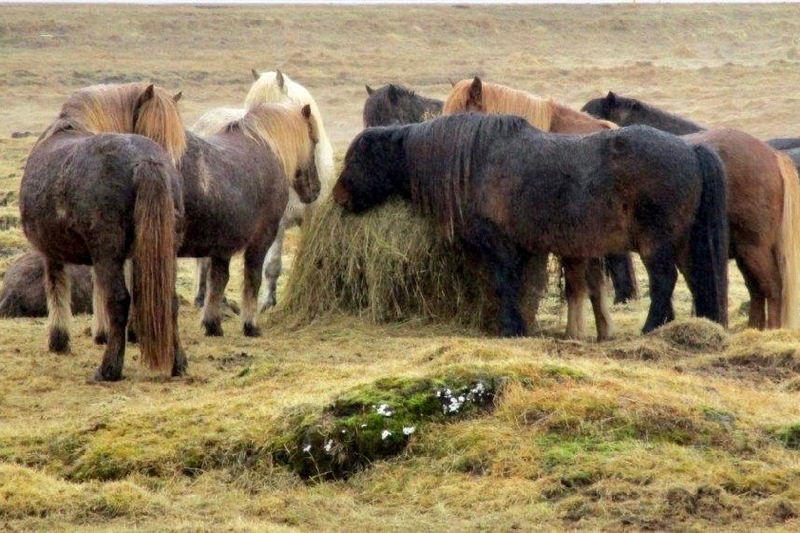 And no tour of Iceland is complete without a jaunt through the countryside atop the famous Icelandic horses –– the only horses, Grace says, that are permitted to live on the island. “While we enjoyed the smooth gait of Icelandic horses, the tour guide told us that the farm owner would not move a particular shed in the middle of the farmland because he believes elves live there,” says Selzer. “He does not want to disturb the elf home because he is somewhat superstitious that things will happen to him or his farm if he does. Breaking from the schedule, some of the adventurers loaded their daypacks with binoculars and cameras ready to see new sights. 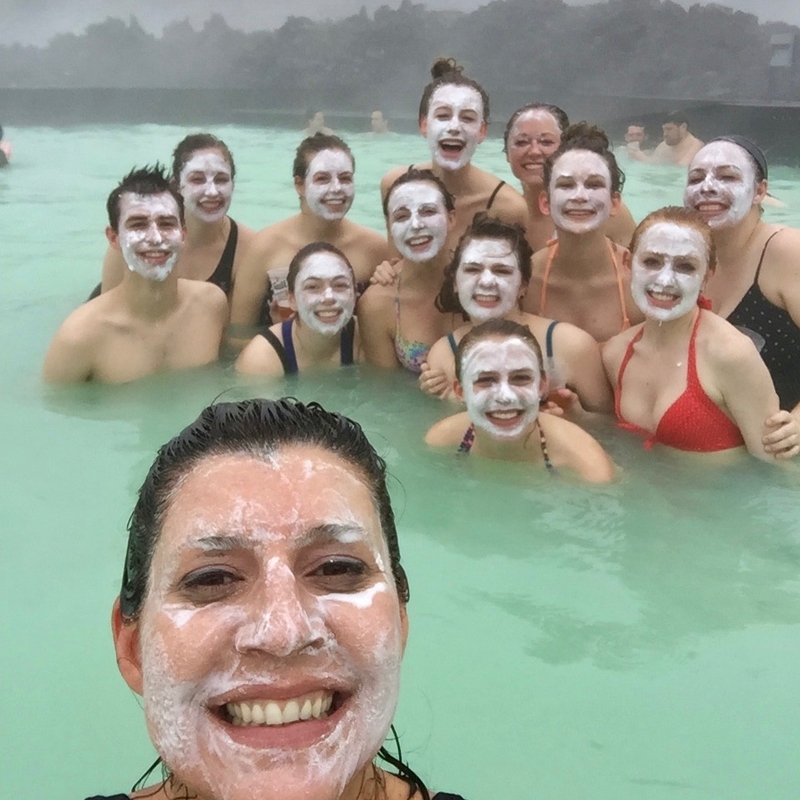 While half the group went off into the countryside to explore the bucolic, treeless landscapes, Selzer tagged along to the Blue Lagoon, one of the most visited attractions in Iceland, for a relaxing day at one of the country's natural geothermal spas. Hoping to catch a glimpse of one of Iceland’s greatest gifts, the Aurora Borealis, the group slipped away from the city lights one night and gazed out under the cloudless rural sky. Grace described a sudden hush sweeping over the wide-eyed students as they stared in awe above the jagged horizon at a swirling emerald glow. “While some people, including me, saw the shimmering vapors as swirls of white instead of neon green, we all enjoyed a magnificent experience under the sky that night,” he adds. 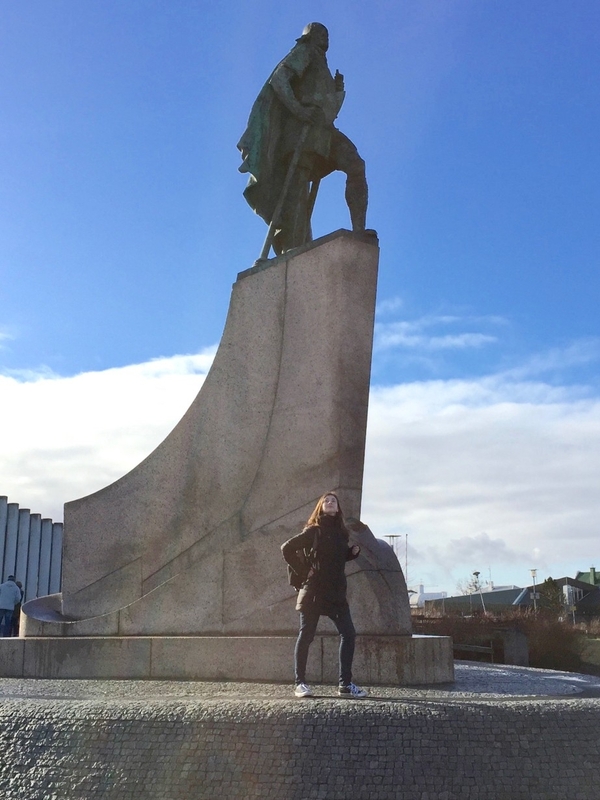 The statue of Leifur Eiríksson (who is known in English as Leif Eriksson) was a gift from the United States to Iceland to commemorate the 1000 year anniversary of Alþingi, the parliament of Iceland. 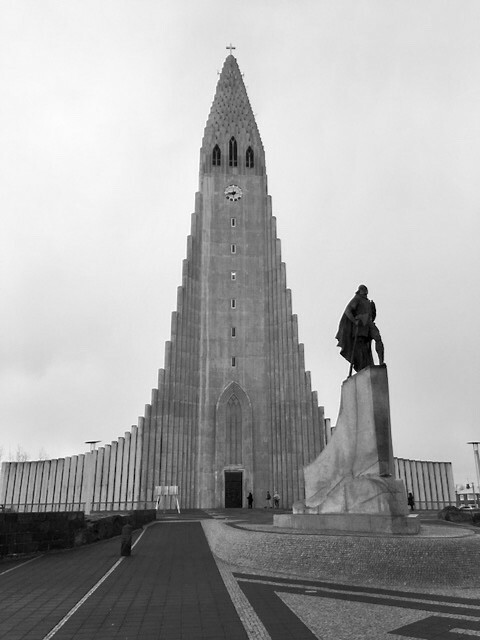 The statue stands in front of Reykjavik's Hallgrímskirkja, Iceland's largest Lutheran parish church. Most students expressed a stronger acceptance of new ideas into their own worldview, especially Jacob Orkwis, a second-year biology student. “Learning about folklore in a place like this truly opened my eyes and mind more than any other class I had taken before,” he says. Recalling their adventures on their blog, the students chatted about eating fermented shark and whale meat, riding tiny horses in the rain and their escape to a natural thermal-heated lagoon with a shimmering aquamarine glow. Some of them shared the awe of staring up at the tallest Lutheran cathedral in the world that seemed to touch the sky. Others recalled how pesky trolls, elves and monsters can be quickly averted by carrying the evil eye protector in their pockets. And a few discussed how brave they can become in deep, dark places when they are together with people they trust. A few young scholars talked about imagining their last names as Nicksdottir or Shaunsson as if they were Icelanders, reminisced about smelling the old parchment in the folklore library and about seeing the wonder of so many stars and the swirling Northern Lights. Saying goodbye to the sights but not to the memories. 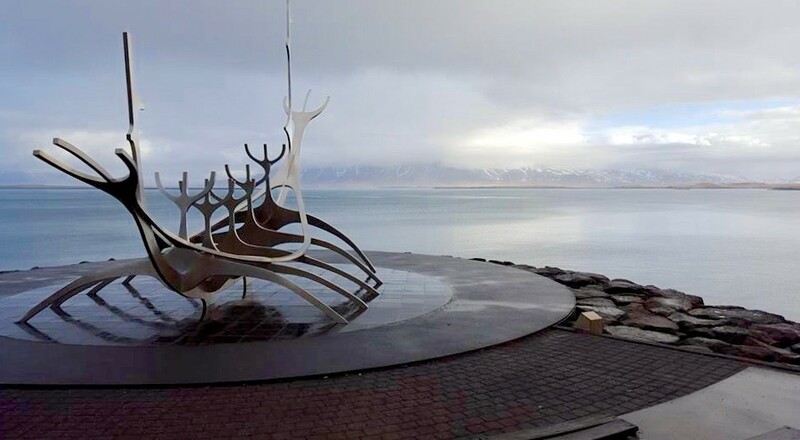 Sun Voyager, a sculpture in Reykjavik by Jón Gunnar Árnason depicts a dreamboat, an ode to the sun. Intrinsically, it contains within itself the promise of undiscovered territory, a dream of hope, progress and freedom. 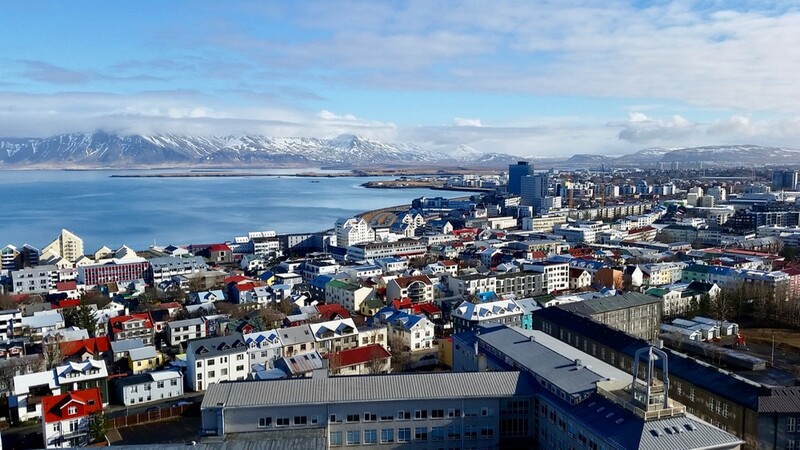 Iceland has an area of 103,000 km2 (about the size of Ireland), but a population of only 330,000 (slightly more than the city of Cincinnati). 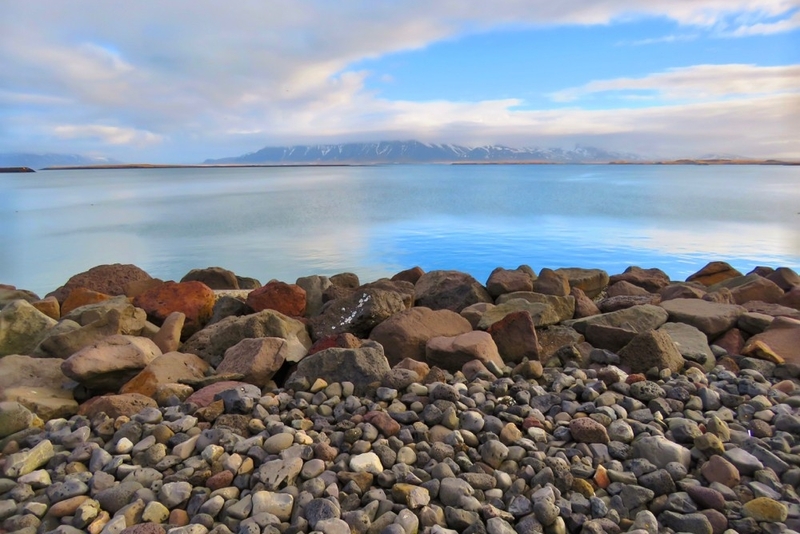 Icelanders speak Icelandic, a North Germanic language descended from Old Norse and West Norwegian dialects. The island is primarily a volcanic plateau characterized by sand and moss-covered lava fields, geysers and natural geothermal hot springs, mountains and glaciers. 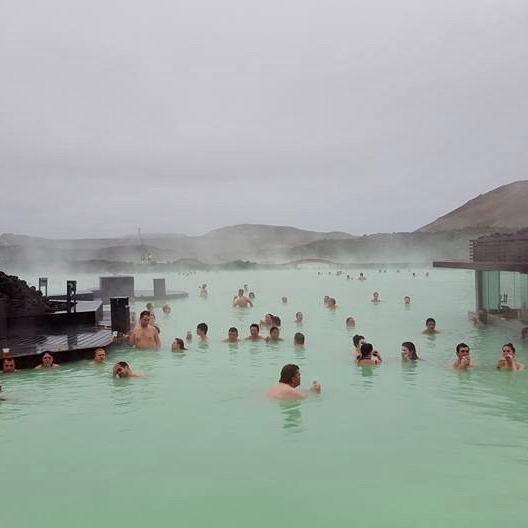 Iceland's active geysers, hot springs, rivers and waterfalls enable the country to operate almost completely on geothermal and hydropowered renewable energy. In 1980, Iceland was the first country to democratically elect a woman president. Vigdís Finnbogadóttir was president until 1996. As a representative democracy and a parliamentary republic, Iceland was the first country in the world to have a political party formed and led entirely by women. The Women's List or Women's Alliance (Kvennalistinn) was founded in 1983 to advance the political, economic, and social needs of women. UC is ranked No. 37 among the top national doctorate-granting institutions for sending students abroad for study or co-ops/internships. France ranked as UC's top study abroad destination from 2014-16. Since 2009-10, UC students studying abroad has increased 113 percent. From 2009 to 2015, the enrollment of international students studying at UC has increased 63 percent. Out of the 45,000 students enrolled at UC for fall 2016 –– 1,014 are new international students from 109 countries around the world. Photo contributions for this story include: Kevin Grace, Robin Selzer, Kara Detty, Natalie Prager, Colleen O'Brien, Jacob Orkwis, Morgan Eberle, Onnie Middendorf, Karissa and Sarina Schroeter. 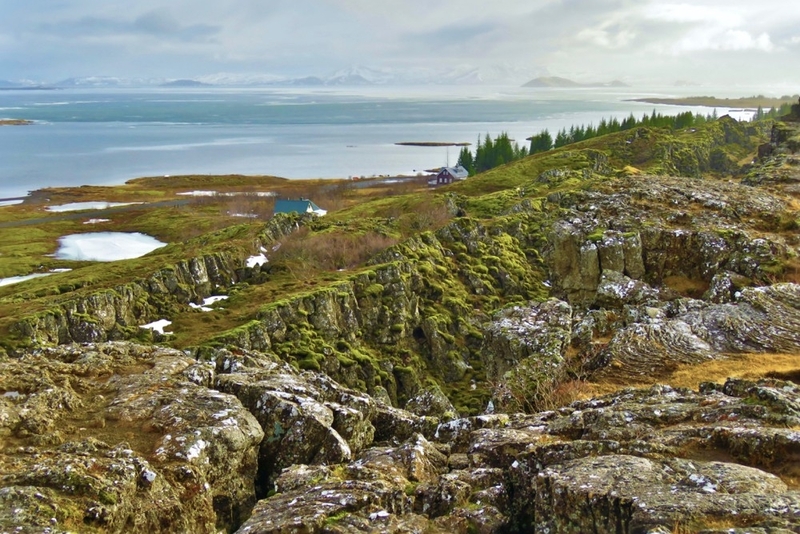 Iceland may be the only place in the world where the effects of two major tectonic plates drifting apart can easily be observed above sea level.